Roman Candle Found Near Site of 10-Acre Grass Fire in San Jose: SJFD Capt. 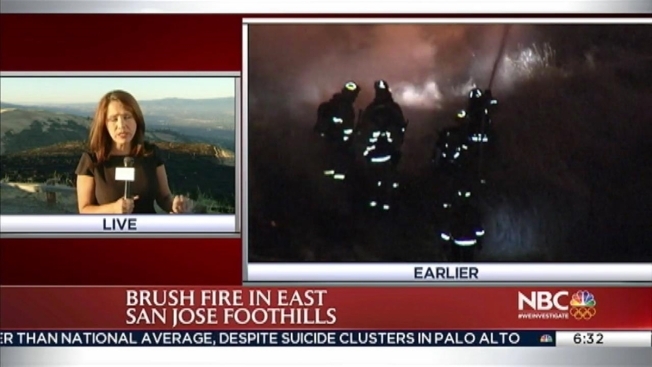 Fireworks possibly started a 10-acre grass fire Thursday that raced through the San Jose hills, charring the dry grass and sending up flames and smoke that could be seen for miles. San Jose Fire Capt. Matthew Paiss investigators were looking into the fact that fireworks possibly were behind the blaze that burned along both sides of Sierra Road over the top of the hill and down toward Alum Rock Park. "This is an area where people have lit off fireworks in the past," he said, adding that the parking lot nearby is often full of the pyrotechnics. He also said that a Roman candle was found nearby, but it was too soon to tell if it was related. With the help of CalFire, he said a total of 70 men and women were able to contain it by 3:45 a.m. and get the flames under control by 5 a.m.
Paiss said the cooler weather conditions early Thursday helped firefighters tremendously in keeping the fire under wraps in what is usually an extremely hazardous, high-danger fire area.